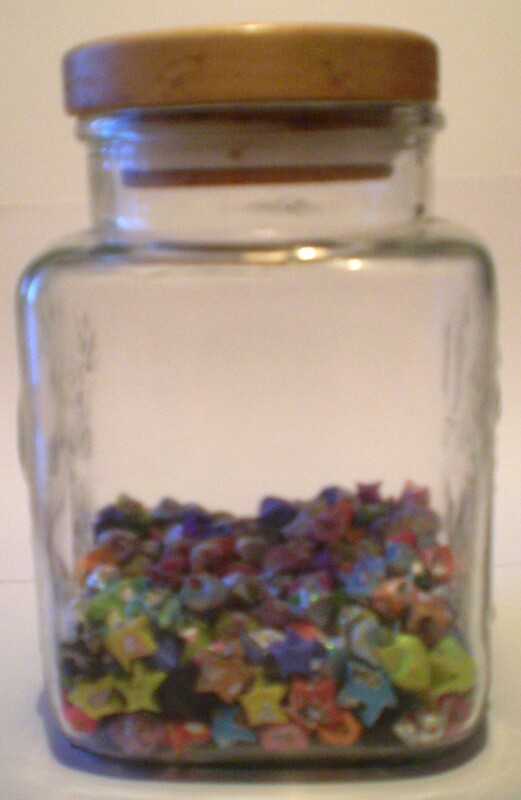 You know that thing where you get a wish if you fill a jar with folded paper stars? Well about a year and a half ago, as I have bad health, decided that I would try wishing for good health. Most people look to God in this situation. I look to hundreds strips of folded paper in a glass container. I could have chosen a smaller jar, but I figure that it’s a large thing to ask for, but now that I’ve gotten only one third full (I only do a few at a time), I realise that it’s no bigger than asking for a pony, which people wish for by just blowing out a few candles. Maybe I should have invested my time in candle making.